Lately I haven’t been at home much, but I have managed to do a number of watercolours of local scenes for an exhibition on landscapes under extreme threat when I’ve had a moment or two. This is one of the paintings in the exhibition – not all the painting is shown here, but the lesson here is in the edges. Note how the distant edges – the top of the hill where it meets the sky and those edges beyond and below the central crag – are soft, indeed, varying in softness along their length. This tends to push them away into the distance and gives more emphasis to the closer, harder edges, such as the almost razor-edged rocks in the foreground. Too many hard edges will create a harshness and detract from a moody feeling in the scene. The exhibition is at the Mid Wales Arts Centre, near Caersws in Powys, and runs from Sunday 30th September to Sunday 28th October, 11am to 4pm daily, and features the pastels of Jenny Keal, my own watercolours, and also paintings by other artists. It was Jenny’s idea to hold an exhibition at which a high percentage of the sales would go to raise funds to protect Wales and the Borders region from wind developments and associated infrastructure, especially vital given the number of public inquiries that will be taking place. We shall also be giving talks on 9th October at the gallery: Jenny will do a pastel demonstration from 2pm and I shall follow it with an illustrated talk on painting and sketching in the Arctic at 4.30pm. Telephone 01686 688369 for details and tickets. Yesterday our county council valiantly rejected the proposals for three giant wind farms, putting us on a collision course with the British and Welsh governments. 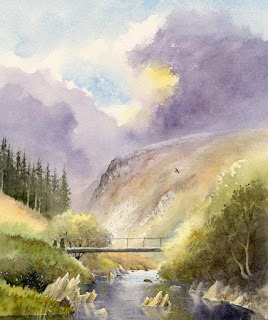 This entry was posted in David Bellamy, Soft edges by David Bellamy. Bookmark the permalink. Muy interesante el texto y una bella acuarela. Saludos. You master watercolor the way I’d wish to! How you mixed hard and soft edge gives a lot of depth to this scenery. Light and colors are brilliant too! You have a great talent David!